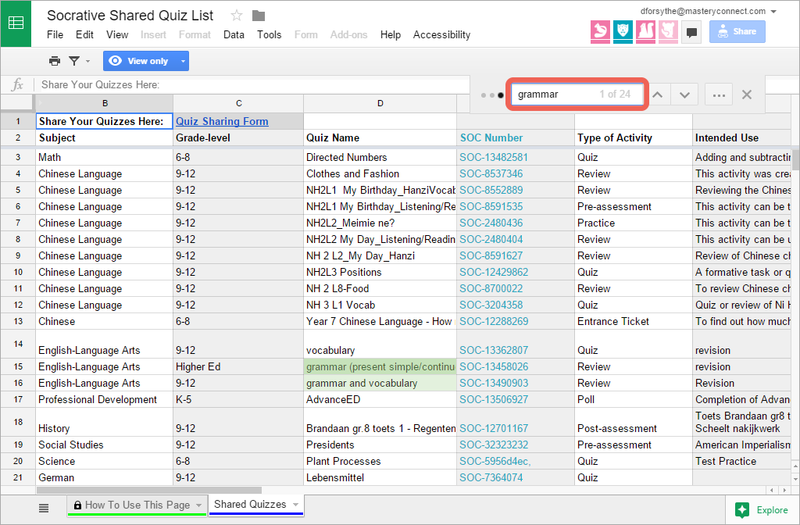 To search for quizzes in the Shared Quiz List, use the keyboard shortcuts Ctrl+F (Windows, Linux, and Chrome OS) and ⌘-F (Macintosh) to quickly open the find bar. Type your search term or keyword in the find bar that appears in the top-right corner of the page. The sheet is automatically searched as you type, highlighting matches in green. The find bar will show you how many results on the sheet match your keyword. Continue to press the Enter key while in the find bar to move through the results. When you find a quiz for which you are interested, copy the SOC Number and use it to import the quiz into your room. To learn how to use a SOC Number to import a quiz, please see our help article on importing quizzes.